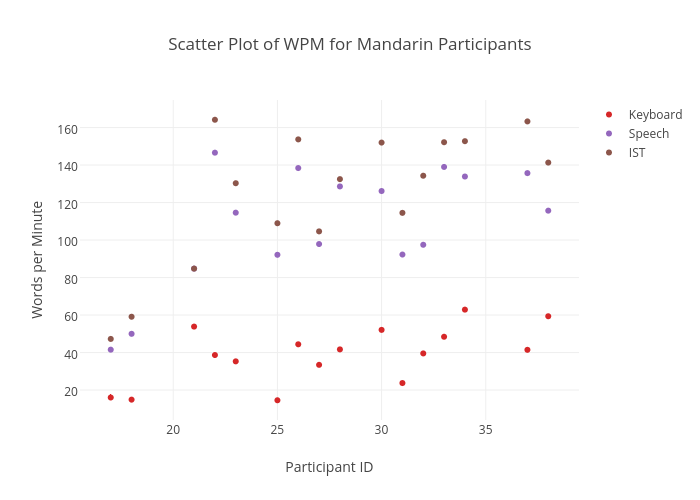 Sherryruan's interactive graph and data of "Scatter Plot of WPM for Mandarin Participants" is a scatter chart, showing Keyboard, Speech, IST; with Participant ID in the x-axis and Words per Minute in the y-axis.. The x-axis shows values from 15.678930651138169 to 39.32106934886183. The y-axis shows values from 3.9064615384615404 to 174.82953846153848.